About my skin: OILY! It’s as simple as that. Some days I’m between oily/normal, depending on my hormones. I do have some past acne scarring and I deal with the occasional break out that needs covering. I also deal with some unevenness, texture, and redness around my nose and chin. 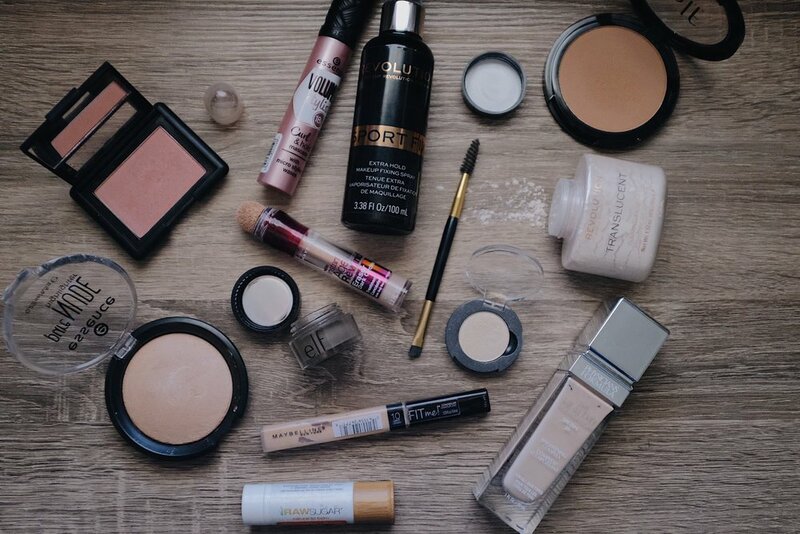 Baking: “refers to letting translucent powder sit on your face for five to 10 minutes, which allows the heat from your face to set your base foundation and concealer, and then dusting it off your face, leaving you with a creaseless, flawless finish. - I can honestly say this is my favorite foundation, it’s like an even tie with my Estee Lauder foundation, which i’m obsessed with. This foundation is amazing for everyday and can be built up, and it DOESN’T cake! Don’t worry, even though it gives a glow and isn’t a matte foundation, this foundation sits beautifully on the skin, stays all day, and doesn’t make me oily! It’s like my skin but better. - I don’t have super dark circles but this under eye concealer just helps me look bright and awake, and it doesn’t crease on me. I do set my under eyes w/ powder though to ensure no creasing and to provide extra coverage. -This concealer is amazing at covering pesky pimples or adding extra coverage to dark spots. It’s also buildable & blendable w/o caking up on itself. -If you’re looking for a powder that makes you look bright and poreless, you need this one! My only negative is that loose powder is a PAIN when trying to apply because it gets everywhere…just don’t wear dark colored clothing while applying. - My newest favorite bronzer! This bronzer has no shimmer and has the perfect amount of warmth for my skin tone without making me look muddy or orange. -This blush gives that nice “flushed” look with a slight iridescent sheen to it, so it’s not flat. Don’t worry, it’s not glittery or shiny and doesn’t clash with highlighter. - This highlighter is perfect for the subtle “lit within” glow. It doesn’t exaggerate texture on the cheeks either, so it’s becomes one with the skin. - I’ll admit, I have a strong hand when it comes to my brows. I love them filled in and dark. Dark brows just make me feel glam and put together! I like that this is a multi purpose product and can be used for liner and brows. This liner/cream stays where you put it, so you kind of have to be careful with the intensity. -Such a great eye-brightening shade! This shadow makes me looks like I got plenty of beauty sleep. -This mascara gives me the perfect curl & hold to my lashes, just like the name says. I don’t even need to use an eyelash torture device…I mean curler. It also doesn’t transfer on my lids or flake! EDIT: I can’t believe I forgot to add a product I can’t live without…sigh…pregnancy brain. I use this product every day. Whether it be to hold my brows in place w/ the eye brow cream or on its own to create a naturally defined & tamed brow. It’s my perfect brow product! - I love this lip balm because it’s rich, so it adds a nice sheen while giving me plenty of moisture! - A lifesaver for oily skin! This spray keeps my makeup in place all day, even through work and naps! - Can you tell this sponge is well loved (and in need of a bath)? I love getting this sponge damp and applying my foundation, concealer(s), AND powder. It’s blends everything seamlessly and for the powder it just helps everything melt together. This simple makeup look also works for those who wear glasses, like me! On days I wear my glasses out and I’m doing my makeup, I make sure to really powder up the area of nose where my glasses sit, so my glasses don’t slip and slide all day.